From time to time it's fun to watch movies and shows about conspiracy theories, strange phenomenons, and other worldly creatures. They titillate the imagination and sometimes even make you question what is real and what isn't. It's entertaining, and at the very least you get a good laugh listening to crazy people give interviews about aliens, moth men and the like. 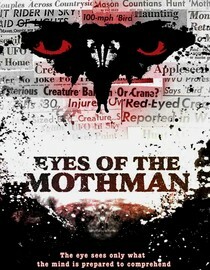 Eyes of the Mothman is one such documentary. It centers around the small town of Point Pleasant, West Virginia and describes a number of strange events that allegedly occurred in the town including, but not limited to: sightings of a giant mothman, UFO's, telepathy, and men in black harassing the locals. Basically, they could have based a whole season of the X-Files on the events that transpired in Point Pleasant. If you're into the supernatural, aliens and conspiracy theories you'll probably enjoy this documentary. It wasn't the best made film in the world but the stories are interesting enough. It went on for way too long and felt disjointed, but I still watched the whole thing. Not a bad guilty pleasure flick. According to Netflix this movie will stop streaming on 2/15/13. Of course, sometimes they lie. Why is it in your queue? Sounded weird and quirky. Is it artsy? Nope, but you may make tin foil hats after wearing it. What stood out the most to you? That guy who was always looking up, even when he was looking forward. You'll know what I'm talking about if you see it. What mood should I be in to watch this movie? Paranoid.